The NYMA Soccer Team opened up the 2017 season on 9/16 as they took on the Darrow School. NYMA looked sharp on defense early on, but Darrow was able to get a couple of early goals and take a 3-0 halftime lead. 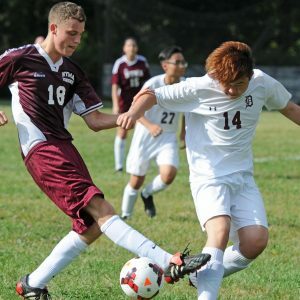 The stellar goalkeeping of Senior Captain Brandon Fooks kept the Knights alive. Sophomore Remy Sykes had a great game on the defensive side of the ball and sophomore Simon Chen gave it everything he had on both ends of the field. Other bright spots for the team were the play of eighth-grader Nathan Kratman, freshman Gianna Whritenour, and junior Chris Wu. The Knights would end up losing the game 5-0 to a very talented and well coached Darrow team. It was the first game of the year and there were many positive things to take away and work on for the next few days in practice.